Desfrute de uma fuga cênica para o berço de Salvador Dalí. 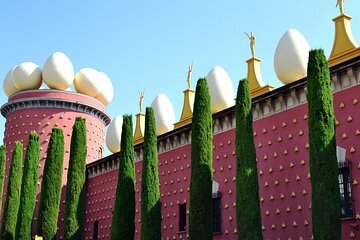 Vá a Figueres, onde você visitará o Museu Dalí na privacidade do seu grupo. Em seguida, você explorará a cidade a pé antes de ir para Girona. Seu guia irá compartilhar a história desta cidade antiga com uma visita à Catedral de Girona. Você terá uma hora por conta própria (talvez reconheça os sites em que o Games of Thrones foi filmado) antes de viajar de volta para Barcelona. Barcelona is beautiful. Rent a car and don’t be fooled by expensive tours. Traffic is minimal and you can park for 20 euro overnight in multiple garages around the city. Vera was absolutely engaging and passionate about the entire tour, from the architecture, culture, and history of Girona to everything Dali. This girl truly knows her stuff! She had given us options to tour the museum alone and I think possibly due to time constraints we were just led by her but no complaints because she brings so much attention to details that I would have never otherwise seen! She was very pleasant during lunch and gave recommendations for other places but eat the Pintxos! and definitely kept the energy levels up. Would recommend her and this tour to anyone interested in seeing a very historic place where GoT was definitely filmed, Girona! and seeing Dali through a art history major's eyes! Though we had to run at the end, Vera was an awesome tour guide, handled our weird requests wonderfully giving us alot more than we were hoping for.